I see you drooling. Here, have a napkin. These are awesome. They look pretty and taste fantastic. I confess, it's not my recipe. 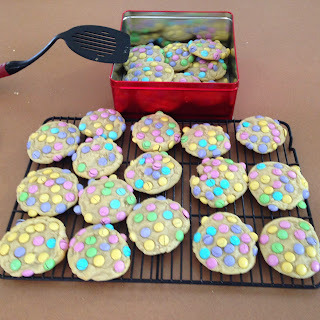 I use the Betty Crocker Classic Sugar Cookie recipe, roll the dough into 2" balls, and press a handful of plain M&Ms into the dough, flattening them out. If you make the full exchange quantity recipe, you will need 2 bags M&Ms, easily. Better grab a 3rd to accommodate for "quality control testing". These things do spread, so space them out on the cookie sheet. Pack them in a tin and soak up the "ooohs" and "aaahs" and "yums" from the team.